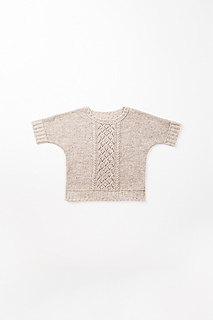 Ideal for twirling across the ice or keeping warm after ballet class, this delicate top of simple lace and cables on a ground of reverse stockinette is comfortable and feather light in Loft. The modern, short-sleeved dolman shape is easy to wear (and put on all by yourself) and a smart choice to knit for fast-sprouting youngsters. Choose a pale shade like Fossil, Woodsmoke, or Snowbound to layer Berenice over any outfit—or splash out with a favorite saturated hue. Full-grown girls will triple flip at the chance to scale up this top in Shelter. Note: while we mention that it is possible to upsize the pattern for adults by using Shelter, this pattern has been written exclusively for the children’s sizing specified. 32” circular needle can be used instead of DPNs if using the Magic Loop method for working small circumferences in the round (i.e. Sleeve Edgings).